I recently attended the HubSpot Pipeline Generation Bootcamp, led by their Sales Director and employee #6, the legend that is Dan Tyre. Dan has successfully led and exited several start-ups, and after spending several hours in his company, and picking his brain, you can understand why this guy rocks in sales. After over 25 years in sales and marketing roles, I wondered what I would learn, but the course had been recommended to me, and after attending a talk at Inbound that Dan had hosted, I was convinced he was worth learning from. Being helpful first to enable you to arrange a more in-depth conversation or meeting. However, the biggest take away was how to sell by saying nothing! It may sound counter-intuitive, but silence should be your biggest weapon when it comes to sales. What’s the most awkward and uncomfortable thing in a conversation? Yes, it’s silence. The urge to fill the void is uncontrollable to the uninitiated. That feeling in the pit of your stomach will overcome you, and you will blurt out anything to break the silence. So how should you manage silences to drive sales conversations? The answer is to use them strategically, and here’s how. Too often salespeople are guilty of launching into hyper-drive when they start a conversation. This is either nerves or poor training. Your opening gambit will make or break your opportunity, and nothing is more crucial that the first line. If you don’t give your prospect the opportunity to process who you are, where you’re calling from and how they think the call will be relevant and helpful to them, you will lose in less than 5 seconds. So, say Hi, introduce yourself and stop, something like this. This 4 or 5 seconds gives the other person time to work out who you are, build a picture if why you maybe calling and respond. When the other person starts to talk you begin something quite special — a conversation. Any skilled salesperson will know that success comes from uncovering your prospect's pains and helping them find solutions that improve their business. This is when a sale starts to develop and form, that magical exchange of value for mutual benefit. So how do you identify their pain? Again, it’s by saying nothing at the right time. Rather than pushing your solution, establish and dig deeper into their issues. In our case, we may establish if generating more sales leads was a challenge for a prospect something like this. “And how’s That going for you?" Now you say nothing, don’t interrupt, don’t try to push your solution. The next voice you hear will be your prospect’s either telling you more about how they have real issues with lead generation or asking how you could help increase their weekly leads. Asking the right questions and zipping it will subconsciously force your prospect to talk. Using this technique will tease out all of their frustrations and enable you to identify the most appropriate way to help them. Once you have identified their pain, spent time advising how other businesses have overcome these issues and secured buy-in from your prospect, it is time to close. A closing statement should be concise, clear and action orientated. It is crucial now that you don’t get sucked into the vacuum that you have just created. Give the other party time to consider your proposal, weigh up their response and give you the answer. They will either be keen to proceed or will give you a woolly date sometime in the future. This only shows that they either haven’t bought into your concept, or it really isn’t a priority for them right now. Either way, you have a decision and can move forward. The power of silence and deliberate pausing in your sales calls, or any conversation, cannot be underestimated. Be aware of what you are saying and deliberately build in pauses into your next conversation, allowing the other party to consider your questions and get them talking. By listening hard, you can uncover the root cause of other peoples issues and discover how you can help them, in a way that other vendors don’t understand. 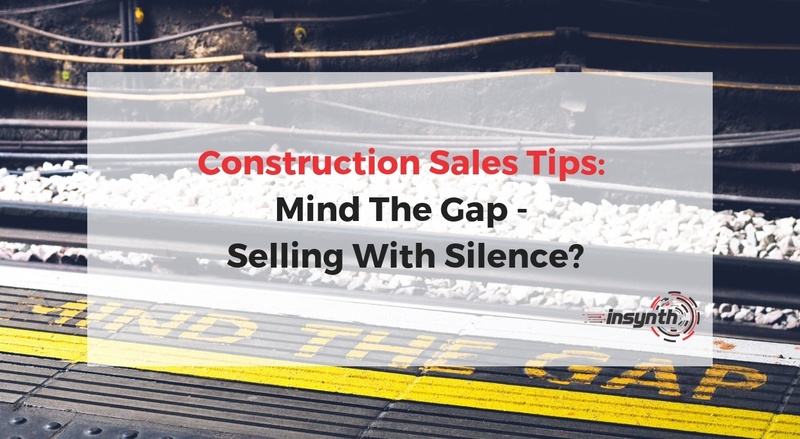 If you want to find out more about how learning to use silence can improve your sales effectiveness, or many of the other lessons we picked up from Dan, please get in touch, we would be delighted to tell you all about it.